When I was in elementary school, maybe third or fourth grade, my mother let me play hookie from school. It was winter, cold, and gray. She took me to see the manatees at our local springs. I love those springs. My high school best friend and I spent many summer days there, baking in the sun, and freezing our way swimming to the boil. Aside from those memories, my favorite thing about going to the springs was the manatees. They are a graceful bunch, those manatees. They only came when it was cold, since the water was warmer in the springs than the river. So, on this bleak, damp, frigid day, my mother allowed me to stay home from school and spend the day watching the manatees. I’m sure we walked throughout the park, too. I’m a sucker for a museum and monuments and history, so I would imagine she let me linger and look. It is a good memory. Lately, I have been thinking more about my mother. And, maybe I am too hard on her, maybe I judge her too harshly. Maybe I am just softening towards her, and finally distance is allowing me to be more gracious in my thoughts regarding her. And, I wonder if that day, she needed me. She needed me to love manatees, to watch me watching them. To call her over to see them. To read the signs aloud to her at the old schoolhouse. The momma and her babies, nursing. Gah. My eyes are leaking. Maybe she needed to see me content, and in my element, so get some contentedness for herself. I write that because sometimes, I just need to see my kids being themselves, doing what makes them, them. Because there is nothing better than watching someone being who they were created to be. I went to high school with some incredibly talented and driven people. Gifted in all kinds of ways: musicians, artists, public speakers, dancers, teachers, and the list goes on and on. And some are gifted at caring for others, seeing a need and filling it, and somehow doing it in a way that leaves one feeling accepted and equal, not pitied. I’ve had a few of those the past couple of years. More than I deserve, for sure. People I am not certain I would have made it out of the hardest of years as in tact, had they not been there to make sure I ate and slept and knew I was heard, and accepted, no matter how clumsy I was in behavior or appearance. They saw my need, and were willing to be themselves around me, thus filling my need. People, we need each other. And, we need each other to be ourselves, and in our element, with each other. I love them. I want one. I need you to be you. Not who you think you should be, not who you’ve been told to be, but you. Whether it is boisterous and charismatic, or subtle and quiet, or both, or in between; we need to see others be themselves. It makes us braver, I think. And, it gives us permission, when we see someone else in their calling or gifting, or whatever you want to call it, to be in our own gifting. That maybe we are all running the same race, or fast walking it, but that we do it together, and in our own proverbial lanes. I cannot run in my friends’ lanes. I will trip them up. But, if I see one next to me, I can be encouraged to run alongside them. To slow down if need be, or quicken my pace if I get a bit distracted. Or, maybe I am encouraged just to see them running in their element. Sometimes, it has to be enough to take joy in someone else’s joy. Friend, be in your element, whatever that may be; be who you are, be the person that you know in your gut you are absolutely purposed to be. In being you, and doing life as you, you give others strength and hope. Be you; and if you need to see someone else being them, you can find me observing the manatees. 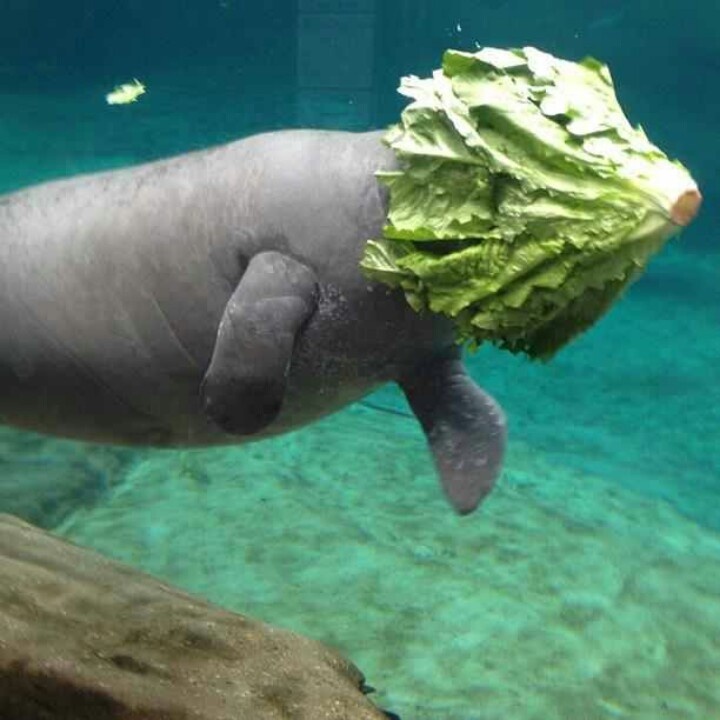 This one is me, in manatee form. Diving face first into food.